The Challenger Learning Center is a not-for-profit 501(c)3 educational organization offering an interactive simulated space science experience for students, public and corporate groups. Each of the over 50 centers world-wide are chartered through the Challenger Center for Space Science Education, founded in Alexandria, Virginia, in 1986 by the families of the seven astronauts tragically lost during the STS 51-L Challenger space shuttle mission. Through scheduled team missions, the Challenger Learning Center promotes leadership, communications, problem-solving and critical thinking skills while supporting our country's goals of improving science, math and technology education. 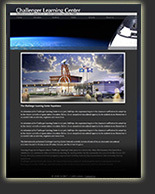 The Challenger Learning Center approached karlfranz.com because the were interested in creating a new, "high-tech", and modern website that better reflected their business and educational goals. To see the result of this redesign, click here.